Whenever Victoria Valos, BA '15, plays guitar, she plays the Beatles' "Blackbird." It's the first song she learned, and she plays it every time to make sure she never forgets those finger-picked chords. Softball, at this point, needs less repetition. This summer, Ms. Valos became the second GW alumna to play professional softball, passing on two job offers in human resources to sign a one-year free-agent contract with the Dallas Charge of the National Pro Fastpitch league. "I wasn't expecting to play professionally," says Ms. Valos, a 5-foot-4 shortstop/second baseman from Bakersfield, Calif. "I was expecting to go into business and start my postgrad life, and I had to turn down a few job offers … tell them that, you know, I'm going to live my dream." The first GW softball player to go pro was Elana Meyers Taylor, BS '06, MBA '11. She spent one season (2007) with the nowdefunct Mid-Michigan Ice before pivoting to bobsledding and the Winter Olympics, where she won a silver medal in 2014 in Sochi and a bronze in 2010 in Vancouver while competing in the twowoman bobsled. For now, Ms. Valos—who graduated as GW's career leader in most of the offensive categories, including hits (206), home runs (36) and RBIs (170)—is sticking to softball, postponing, at least for a summer, a career in human-capital consulting. She'll return to GW in the fall to start work on a master's degree in organizational sciences, which she'll add to a bachelor's in psychology. Ms. Valos survived two tryout camps in Texas to make the Charge, which culled her and two others from about 30 free agents invited to audition in front of coaches, management and ownership. "I wasn't nervous because I just kept thinking, I've been playing this game for so long. They either take me or they don't," Ms. Valos says. "I was confident in what I had to offer them, and when we started the tryout itself, I realized that my skills were pretty high up there compared to who was there. I was happy. I was confident. I was in a very calm mind-set." 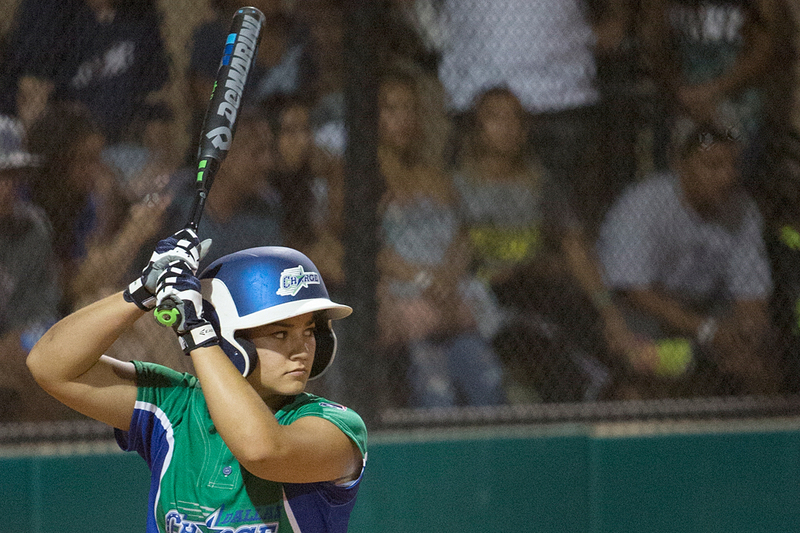 The Charge, an expansion team in its inaugural season, went 17-31 and finished fourth in the five-team NPF in 2015. Ms. Valos played in 17 games, mostly as a pinch runner and defensive replacement. She had one hit in five at-bats.